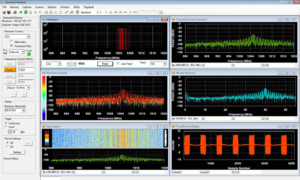 The spectrum analyzer software, SpectraScopeRT, requires no programming and allows for control of receiver center frequency, bandwidth, and signal recordings. SpectraScopeRT features real-time FFT power spectrums (with peak hold and persistence), spectrograms, histograms, and time domain displays while recording, and upon recording playback. SpectraScopeRT/SpectraViewRT signal recording and playback viewer applications for combined ThinkRF downconverter and GaGe digitizer operational control with IQ time domain, I spectrum, IQ power spectrum, constellation, spectrogram, persistence, and histogram displays. To accommodate customer integrated solutions, the digitizers and receivers have full control and data acquisition support via Mathworks MATLAB. Example programs are furnished to facilitate rapid signal processing and modulation analysis program development. Additional SDKs and example programs are provided for C/C# and LabVIEW. Real-time streamed analysis and processing is fully supported with either an on board FPGA or a PCIe 3.0 GPU board. These solutions allow real-time processing on data streams exceeding 3 GB/s. The combined solutions allows application developers to extend their capabilities or build new products that meet customer requirements.